For fans of Linwood Barclay, this exhilarating series debut by award-winning author Robert Mrazek features former Army officer Jake Cantrell as he tries to solve a series of murders at a small college town in upstate New York. Unfairly disgraced former army officer Jake Cantrell has only one friend left: Bug, a wolf-dog he saved while serving in Afghanistan. Together, they try to put his bitter past behind him and Jake settles for employment at the bottom rung of the campus security ladder of a small upstate New York college. But things only turn worse when the college's richest and most powerful alumnus is found hanging from a campus footbridge on the eve of homecoming weekend. Jake is convinced the man was murdered, but with no credibility to his name, no one agrees--at least not until a second body is found hanging from the same bridge. But as a vicious hurricane sweeps up the Eastern seaboard, the clock is ticking and it's only a matter of time before the killer strikes again. 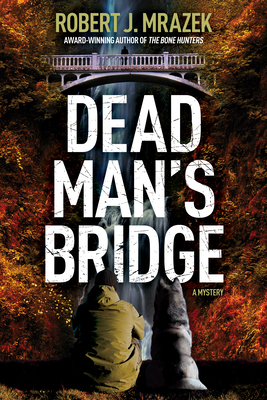 Trusting his instincts, Jake puts his own life in peril as he attempts to uncover the buried secrets at the heart of the murders in acclaimed author Robert J. Mrazek's Dead Man's Bridge, the first in a new heart-pounding mystery series sure to keep readers hooked until the very last page. Robert J. Mrazek is the award-winning author of ten books. He is the writer and co-director of the feature film, The Congressman and a former five term member of the US House of Representatives. He lives in upstate New York and Maine. Robert is a member of the International Thriller Writers (ITW). This is his first Jake Cantrell mystery.